Indirasite: How to make every day is a good day? How to make every day is a good day? matter the most to keep our every day as a good day? According to the Buddhist philosophers, there is something invisible phenomenon that helps to make our every day a good day. The feeling of wellness and happiness grow in the mind and comes from the heart. We become sad because of external factors that destroy our happiness. It is a common bad habit if someone scolds us or criticizes badly for what we are doing or what we did in the past, we become unhappy because of those consequences. That is the reason we are depressed, sad and unhappy. But if we keep our mind into that inner peace where nothing can enter, where nothing can distract, where nothing can grow except peace, then we will be directed to the happiness and we will see our every day is a good day. The trouble and suffering come from the external circumstances that are out of our control. We can't stop what people think about us, we can't think what the outer circumstances may change every day, but we can control only one thing that is our mind and inner peace. We have to control our mind not to take that bad talk of people; we can stop the outer circumstances not to enter inside our mind. Doesn't matter what someone talks about if we don't take that seriously, we will be always happy. 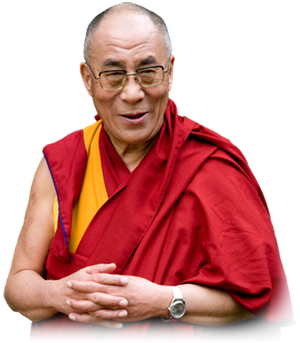 According to the Dalai Lama; happiness is the satisfaction and peace of mind. We are the source of happiness by ourselves. If we harm the people we have to face the suffering in the consequences of that, but if we help the people we are more satisfied for bringing the happiness of other people. Happiness can is be increased in size if we share its value with other, if we tried to keep the happiness within ourselves it will not sustain. Love the people not only because they also love us, care for the other not only with the expectation of the return.